...that Freeborn Otzot invented the OXA Machine? ...that Rahndel the Vandal has been Perfected? ...that the large ring orbiting the Tangled Shore is a portal to the Dreaming City? The Swarm Princes are the leaders of the Hidden Swarm; four Hive Knights who are sworn to the Hive god Crota as well as one of the four living Worm Gods each, even though they all serve their commander Sardon. 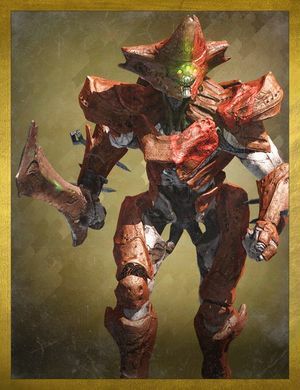 In the past, they created Crota's Sword and were charged with protecting it in his absence, only to be challenged by the Guardian and defeated with the very sword they made. In the Destiny 2 Forsaken expansion, three of the princes return in the Dreaming City as the fourth week's Ascendant Challenge seen in the midst of a ritual, the one missing being Banuk while the rest bear the title of "Spurned by" their respective Worm Gods. They are eventually slain in the same way as they were the first time. Occasionally, there is a glitch were if you kill a Prince with the slam attack, they won't disintegrate, allowing the player to take a closer look at a Knight model. This was never patched out of the game.